Prime Minister Sheikh Hasina on Monday reiterated her call to the Jayiya Oikya Front (JOF) MPs-elect to join parliament as she said the ruling party wants a strong opposition in real sense. The Prime Minister said this in the House while participating in the general discussion on the President’s speech and delivering her winding-up speech, reports UNB. “We want a strong opposition party in parliament, I hope those who got people’s votes will speak in Parliament and make comments on us whatever they want to,” Sheikh Hasina said. The Leader of the House said there were attempts to foil the election. “But people never paid their [spoilers] attention to that. Instead, they’ve exercised their voting rights and elected us,” she said. Hasina also mentioned that it is the prime duty of the government to fulfill the pledges they have made to people before the election. “We’ve taken extensive programmes to eradicate terrorism, drug abuse, smuggling, women and children trafficking. Our drive against corruption is also going on,” she told the House. Hasina said people voted Awami League to power to demonstrate their support to it due to the ongoing dives against terrorism, militancy, corruption and drugs. The Prime Minister said the government is trying hard to eradicate corruption from the country although it is a tough job. The Prime Minister thanked all the political parties for participating in the 11th general election. 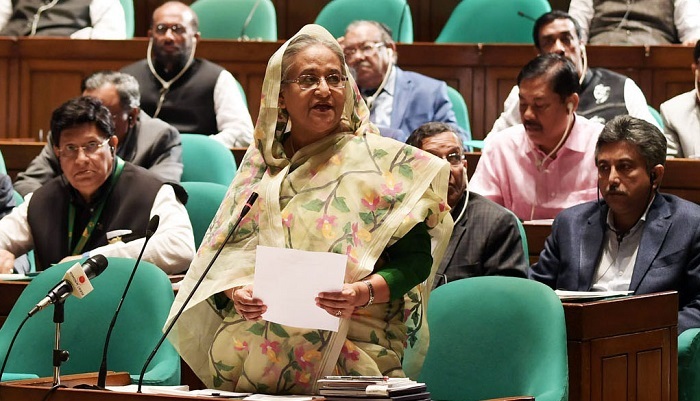 Talking about the recently-signed memorandum of understanding with Saudi Arabia over military cooperation, Hasina said members of the Bangladesh Armed Forces will never ever engage in any war joining hands with another country. “We’ll go only for protecting peace under the United Nations…our armed forces will be deployed only for protecting the two holy places —Makkah and Madinah—if any crisis arises there,” she said. The Prime Minister also mentioned that there is no scope for any misunderstanding in this regard. Later, the House passed the vote of thanks on the President’s speech by voice vote.